Come visit us in our showroom! 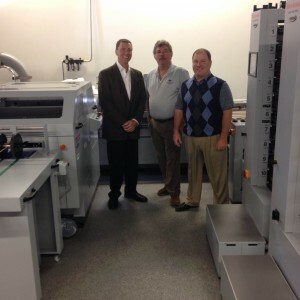 Atlantic Graphic Systems has a state-of-the-art showroom that features equipment from Therm-O-Type, Horizon Finishing, Spiel Associates, and more! Enjoy an espresso and a pastry while our team demos the latest printing and finishing technology for you. No matter what stage of production you need equipment for, our showroom has it! Here are a few more reasons you can benefit from visiting our showroom. You can only tell so much about the quality of a piece of equipment from looking at its image on the website. When you visit a showroom, you have the opportunity to see the equipment in action. This gives you a better feel for whether or not a particular piece of equipment is exactly what you are looking for. There are many times when someone will visit the showroom only to find that they are not completely satisfied with a piece of equipment they were eyeing. By looking at other equipment in action, you can test and try until you find the perfect machine for your operation. It can be difficult to find out everything you need to know about a piece of equipment when all you have is a web page. Talking to a salesperson is a great way to get detailed information about a piece of equipment before you make the purchase. You can ask questions that you need answered, and a few crucial questions may even occur to you on the spot! We’re glad to answer all your questions and help you to fully understand your machine before you make the important decision to purchase. Visiting a showroom is a great way to keep up with the latest technology! You can see the newest machines and learn all about their updated features. Ask one of our team members to demo the machine for you so that you can understand how it works! Even if you are not buying at the moment, a showroom is a great place to solidify your knowledge of printing equipment and keep up with the latest innovations. This entry was posted on Friday, March 11th, 2016	at 4:29 pm	and is filed under New printing equipment	. You can follow any responses to this entry through the RSS 2.0	feed. Both comments and pings are currently closed.